This project involved the design of a temporary pavilion for the 2017 Sziget Festival which is one of Europe’s largest music and cultural festivals held each year in the Hungarian capital of Budapest. Budapest is a city built on water. The historic cities of Buda and Pest, sitting on opposing banks of the Danube river, were unified in 1873, along with the island city Obuda, to become the new capital city of Hungary. Known as ‘The City of Spas’, Budapest’s thermal baths play a vital role in urban life in the city. The baths have become key public buildings and social gathering spaces. One of the oldest and most popular spas in Budapest is Rudas Turkish Bath, which was built in 1550, during the time of Ottoman rule. Our proposed pavilion is driven by Budapest’s relationship with water and is a place to gather and relax during the Sziget Festival. It synthesises key elements within the Rudas Bath, namely the famous Turkish Room, with its octagonal pool and dome, and the Rams Head drinking fountains. We employ these to create a space that is immediately familiar to Budapest, but also, quite literally, refreshing, due to its unexpected context within the festival. Form: Careful use of geometry and proportion are used for the Pavilion, both in plan and elevation. Squares, circles, and octagons create an ordered space with central focus. Golden ratio has also been used to generate the ‘dome’ and octagonal ‘clerestory’ forms, typically found in Turkish Baths. We will 3D-scan the Rams Head fountain to create a 1:1 scale replica within the Pavilion. Colour: The Pavilion will be monochromatic throughout, using the intense shade of Ultramarine Blue. Ultramarine literally means ‘beyond the sea’ and evokes images associated with water, including the Blue Danube itself. Materials: A simple and robust palette of materials has been selected in order to meet the budget requirements, and to facilitate prefabrication and recycling. External grade plywood, simple steel frames, and scaffold netting will be used throughout. Results: The Pavilion will create a uniquely strong and intriguing presence at the festival, thanks to its use of colour, proportion, and forms that are all familiar. 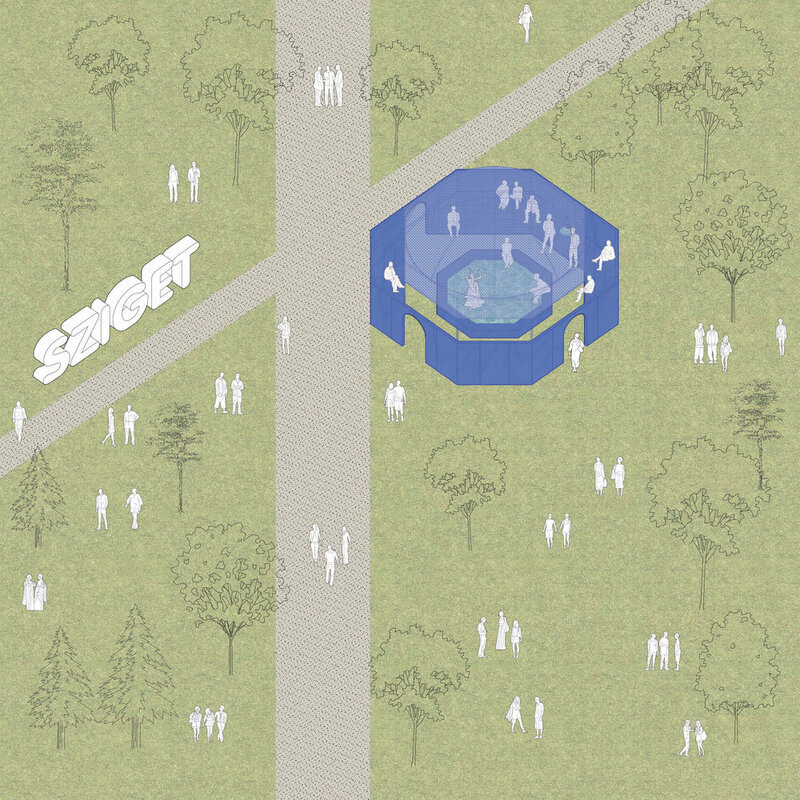 The Pavilion will offer a place of respite from the heat of the summer, and freedom from the hustle of the festival. It will offer a place to rehydrate and cool down, and will inspire festival-goers to experience a relationship with the waters of Budapest.